Penn State President Erickson gives in to anonymous threats! On Sunday morning 22 July 2012, almost under the cover of darkness, the orders of Penn State President Rodney Erickson were carried out and Joe Paterno’s statue was removed. Access to the statue was blocked off shortly after 6:00 am on Sunday morning and the statue was fully removed by 8:20. They went behind the tarp – the same sort of arrangement used on a race track when an injured horse has to be dispatched – and divided the statue from its foundation, trussed it with a moving blanket and shrink wrap and forklifted the whole deal inside the stadium, presumably never to be seen again. . . . After all these months, Penn State still doesn’t get it. The school created this mess because of a culture that believed in doing things behind curtains. Troublesome situations were to be managed. What was good for business was good for the school. What the rest of the world didn’t know wouldn’t hurt it. Well, here we are, and what has changed? The fences and tarps and the timing of a monumental shift happening at dawn on a Sunday morning says that very little has changed. 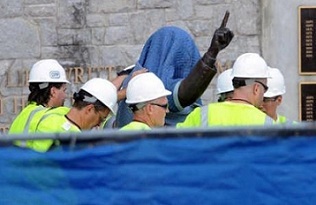 On July 15, Penn State released a statement saying that no decision regarding the statue had been made. Some trustees also said in interviews they want to resist being pressured by the media into a sudden decision about such an emotionally charged issue. Although some trustees said in discussions Thursday and Friday in board meetings in Scranton, Pa., they believed the statue eventually would have to be torn down, most quickly reached a consensus it should remain standing in the coming weeks and months, trustees and a person briefed on their discussions said. Some trustees went even further, insisting Paterno’s statue outside Beaver Stadium in State College, Pa., never should be removed. Since the Freeh report revealed Paterno’s role in covering up child sexual abuse allegations against Sandusky, former coaches, commentators and members of the public have demanded the Paterno statue be torn down immediately. Some have also called for the removal of Paterno’s name from the university library; the Paterno family donated more than $4 million to the university. On Saturday, a campus security guard stood a few paces from the Paterno statue outside Beaver Stadium, keeping watch for would-be vandals. On campus, rumors have circulated that campus police officers might try to dismantle the statue in the early morning hours when no one is watching. For anyone questioning the reliability of Van Natta’s sources, it was his article that cited the rumors about the statue being removed “in the early morning hours when no one is watching.” President Erickson’s decision to remove the statue between the hours of 6:00 a.m. – 8:00 a.m. tells me that those rumors have apparently been confirmed. 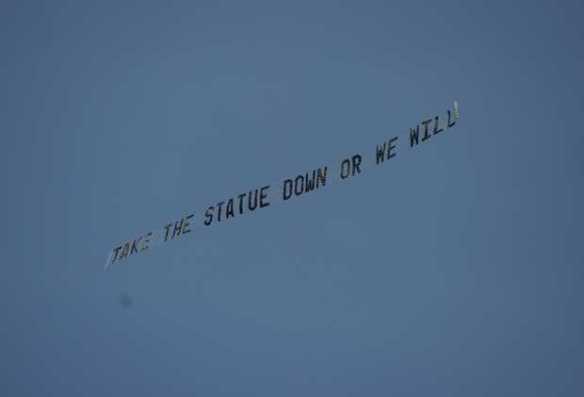 Then, on 20 July 2012, it was reported that PSU spokesman David La Torre said a decision on the statue’s future would be made “next week” as PSU president seeks input from trustees, alumni and other constituencies. The decision to remove the statue apparently came about two days later, as the statue was removed on 22 July. Such a fast turn around leads me to reasonably believe that the decision was either already made when David La Torre made his statement on 20 July, or that President Erickson didn’t seek as much “input” as one might like. Since we learned of the Grand Jury presentment and the charges against Jerry Sandusky and University officials last November, members of the Penn State community and the public have been made much more acutely aware of the tragedy of child sexual abuse. Our thoughts and prayers continue to go out to those victims of Mr. Sandusky and all other victims of child abuse. I assure you that Penn State will take a national leadership role in the detection and prevention of child maltreatment in the months and years ahead. With the release of Judge Freeh’s Report of the Special Investigative Counsel, we as a community have had to confront a failure of leadership at many levels. The statue of Joe Paterno outside Beaver Stadium has become a lightning rod of controversy and national debate, including the role of big time sports in university life. The Freeh Report has given us a great deal to reflect upon and to consider, including Coach Paterno’s legacy. Throughout Penn State, the two most visible memorials to Coach Paterno are the statue at Beaver Stadium and the Paterno Library. The future of these two landmarks has been the topic of heated debate and many messages have been received in various University offices, including my own. We have heard from numerous segments of the Penn State community and others, many of whom have differing opinions. These are particularly important decisions when considering things that memorialize such a revered figure. I now believe that, contrary to its original intention, Coach Paterno’s statue has become a source of division and an obstacle to healing in our University and beyond. For that reason, I have decided that it is in the best interest of our university and public safety to remove the statue and store it in a secure location. I believe that, were it to remain, the statue will be a recurring wound to the multitude of individuals across the nation and beyond who have been the victims of child abuse. On the other hand, the Paterno Library symbolizes the substantial and lasting contributions to the academic life and educational excellence that the Paterno family has made to Penn State University. The library remains a tribute to Joe and Sue Paterno’s commitment to Penn State’s student body and academic success, and it highlights the positive impacts Coach Paterno had on the University. Thus I feel strongly that the library’s name should remain unchanged. Coach Paterno’s positive impact over the years and everything he did for this University predate his statue. At the same time it is true that our institution’s excellence cannot be attributed to any one person or to athletics. Rather, Penn State is defined by our actions and accomplishments as a learning community. Penn State has long been an outstanding academic institution and we will continue to be. The world will be watching how Penn State addresses its challenges in the days ahead. While some may take issue with the decisions I have made, I trust that everyone associated with our University will respond in a civil and respectful manner. I fully realize that my decision will not be popular in some Penn State circles, but I am certain it is the right and principled decision. I believe we have chosen a course that both recognizes the many contributions that Joe Paterno made to the academic life of our University, while taking seriously the conclusions of the Freeh Report and the national issue of child sexual abuse. Today, as every day, our hearts go out to the victims. As of right now, it is unknown who the “We” is referring too. Regardless, the statue did come down five days later on 22 July. Unfortunately, President Erickson did not do himself any favors in diffusing the idea that this threat influenced his decision. What about the trustee who was quoted as saying “You can’t let people stampede you into making a rash decision?” Unfortunately, it appears that you did. This entry was posted in Penn State by Travis Normand. Bookmark the permalink.